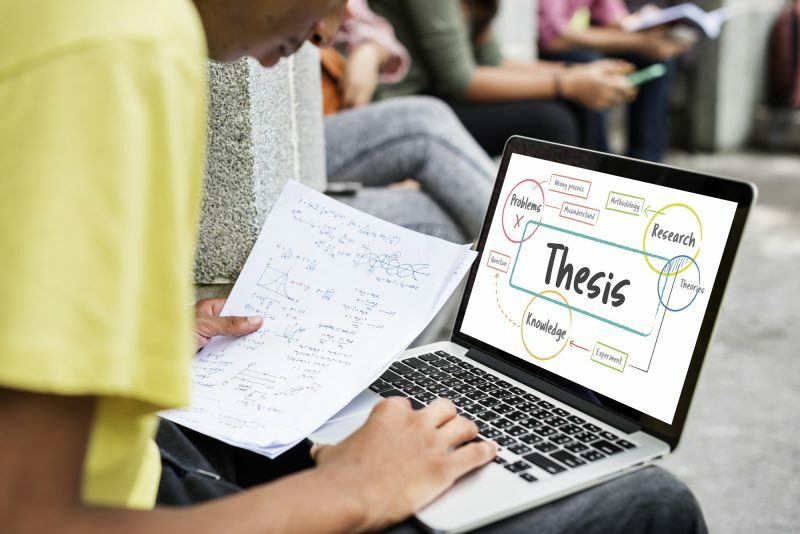 The term “Thesis” is somewhat broad, capturing a range of different meanings and usages, all relating in some way or another to written academic inquiry. So, firstly, we have Thesis in the sense of an unproven statement advanced as a premise in an argument. In this context, we may speak of a “thesis statement”, which denotes the main idea or central focus of the study. You will most likely have heard or read about thesis statements before. They are a fundamental component of essay writing, included usually in introductory sections so to inform readers of the text's key line of reasoning. Secondly, we have Thesis in the broader sense, of an extended academic composition in which an argument is presented. Oftentimes, Thesis, in this context, relates to a final assessed piece of work. The term tends to be applied commonly to the final Masters or Doctoral degree papers. However, the undergraduate dissertation may also be considered a Thesis. In both the above instances, we are concerned with a specific way of testing an argument. A Thesis, then, is not a topic or perspective. Rather, it is the formulation of a particular mode of analytical approach. The thesis statement works as the central ordering principle of an academic work, functioning as a claim which is to be tested (and thus may be refuted). Proving the validity of a thesis statement is the impetus of the essay. We have thus far been speaking in somewhat abstract terms. This can make it difficult to properly grasp the point. So we shall now look at specific examples of thesis statements; then we will explain how and why they meet the criteria. Example 1: In light of the National Farmers Union's counsel that 95,000 new seasonal workers (the majority coming from Poland, Romania and Bulgaria) will be needed by 2021 to sustain the agricultural industry, the Government's plans curb net immigration to 99,000 by 2022 is untenable. Here, the central idea is clear: that the Government's proposed immigration policy is incompatible with sustainable agriculture. Note that the statement explicitly uses numerical information to make a key claim (that there is a discrepancy). We are arguing that there is a contradiction between the supposed outcomes of planned legislation and the likely actual outcomes of it. Having incorporated these figures at this key stage, they must necessarily be factored largely into the body of the work. Working from the above thesis statement, then, the rest of the paper would build supporting arguments around this position. This might include citing comparable cases from other countries, additional data from agricultural research or other kinds of scholarly work. All manner of evidence may reasonably be brought to bear – just as long as it is oriented around the thesis statement. Example 2: The true source of the Prince's inaction in Shakespeare's play Hamlet is not that he thinks too much, but rather that he thinks too well. It is not paralysis through analysis (of his specific situation) that halts him; it is a nihilistic realisation that all action (in all situations) is ultimately futile. In this example, we have framed our thesis statement in relief to an implied counterclaim (that Hamlet cannot act because he overthinks). By positioning our own claim in contrast to an opposing claim, we set up our argument as an oppositional one. As such, we are going against the grain of scholarly consensus. Accordingly, the bulk of the work will be spent in justifying this contrary viewpoint – by way of example, critical sources, textual analyses, and so on. Example 3: Emile Durkheim famously suggested that Marxism was “not a science”, but instead “a cry of pain”. This paper refutes Durkheim's claim, arguing that Marxism may be seen as a science because it exhibits the formal, systemic properties which characterise scientific processes. In this example, we have built our thesis statement around a quote, which we intend to dispute. The quote underlines the importance of the central argument, that Marxism is indeed a science, because it demonstrates that one of the twentieth century's most respected thinkers vocally contested the idea. You will have noticed that the thesis statement is broad enough to allow a fair amount of scope in inquiry while being narrow enough that the central argument sets very specific expectations. This is very useful because it allows us to clearly render the primary research problem/objective while leaving us room to decide how best to approach it. As long as your essay makes good on the expectations established in the thesis statement, you are free to apply diverse methods in how you go about constructing your argument. Constructing an argument is a considered and methodical process. Each paragraph ideally will contain one key point or present one principle argument. These points should lead logically from one to the next, pulling the focus of the case tighter and tighter: working toward a precision point in the conclusion. Because Theses can often be very long works, you will want to keep you attention on the matter immediately to hand. That is, work on one piece of the argument at a time. Do not get bogged down in trying to process the entire case, as if it were an integral whole. If you work at a steady pace, carefully crafting one sentence at a time, you will find that your overall argument will gradually come to you, as opposed to you having to chase it down. In many ways, the act of writing will clarify and refine your thinking, such that you will gain a better understanding of your research topic be re-reading the text you yourself have composed. If you are composing a Dissertation, Masters or Doctoral Thesis, you will have a decent amount of work ahead of you. This may well be the longest piece of writing you have done and ever will do. The best way to approach a large scale project is to break it down into chunks. You might find it easier to conceive of the different chapters of the Thesis as individual essays – only, essays which have a chronological relationship with each other. Perhaps the biggest dividing factor between students who achieve the highest marks and those who do not comes down to the revisionary process. Good writing is rewriting. The more time and effort you put in to reworking your text, the better it will be. This makes good sense. There are very few products (either intellectual or material) in life which come out in their best form on the first try. You know from your own experience that new gadgets (smartphones and the like) take a few versions before the model works as it should. Good argumentation works in the same way. It takes time, practice and dedication. Even doing one rewrite will undoubtedly bump up your grade significantly. Be patient. Give yourself plenty of time and work at a steady pace. Allowing elbow room for editing will make the difference when it comes to the final submission. At Essay writing Service UK, we know that getting the grades you need is the most important aspect of your studies. The experience is vital and worth the effort of course but the most important aspect must be the qualification. We, along with our expert academic writers, offer thesis writing services of the highest quality to ensure that you have all the help you need if this should become troublesome. If you need advice or help with your thesis, let us know and see what we can do for you.